Scientists today described development of a new fuel mixture to ease the major air pollution and cost problems facing cruise ships, oil tankers and container ships. These vessels tend to burn the cheapest and most highly polluting form of diesel fuel. Their report was part of the 244th National Meeting & Exposition of the American Chemical Society, the world’s largest scientific society, being held here this week. George N. Harakas, Ph.D., explained that large ships have slow-speed engines designed to burn inexpensive, thick “bunker fuels” that literally are the bottom-of-the-barrel from the petroleum refining process. 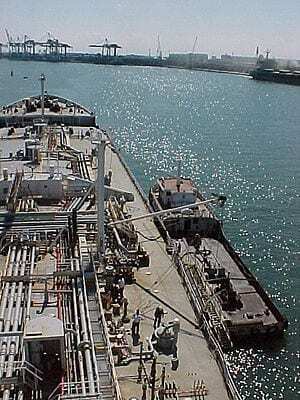 Bunker fuels are high in substances (such as sulfur) that produce air pollution, which creates a serious health and environmental problem when ships cruise along the shore or drop anchor in ports of heavily populated urban areas. Harakas and colleagues from the Maine Maritime Academy and SeaChange Group LLC developed a fuel by adding two ingredients to low-sulfur diesel to produce “Bunker GreenTM” fuel, a member of the Eco-HybridTM family of fuels. One ingredient was glycerol, a thick, colorless liquid widely used in foods, medicines and other products. Glycerol is a byproduct of biodiesel production, making it a cost-effective, carbon-neutral and domestically sustainable fuel. Blending glycerol and diesel fuel is literally like trying to mix oil and water. The use of a surfactant, a class of chemicals similar to ingredients that boost the cleaning power of laundry detergents, was used to solve that problem. The fuel they produced has improved emission properties and the potential to lower fuel costs for the shipping industry.